2010, DreamWorks. Directed by Mike Mitchell. Running time: 93 minutes. PG. Starring: Mike Myers, Eddie Murphy, Cameron Diaz, Antonio Banderas. Helm: This film was an irresponsible travesty. Mathew: What? I admit it wasn't as good as the other Shrek films, but it wasn't that bad. Helm: It featured an ogre as a loveable hero. Mathew: Yeah, that's the thing about the Shrek movies. They have a loveable ogre for the hero. Helm: I have faced many ogres in my day and they are amongst the most vicious, deadly, merciless and vile minions of evil to walk the earth. Mathew: That's exactly why the first Shrek movie was good, because they took a horrible ogre and showed that he had a warm, human side to him, despite his surface appearance. Helm: But that is a stupendous lie. Ogres are heartless brutes--more like animals than men. The only thing warm and human about them are the chunks of undigested men in their foul smelling droppings. Mathew: Okay. I hear you. But that was kinda the point. 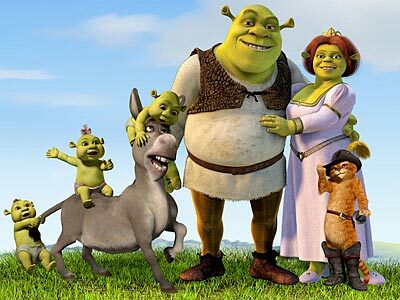 The first Shrek film was all about getting past our shallow, stereotypical impressions of how things are supposed to be and focusing instead on what's really there. It was all about skewering the typical cliches of fairytales and fantasies. Helm: I recall no such skewering in this film. Helm: Cashing in on that film? Helm: That is faint praise coming from such a monumental idiot. A potato might appear very astute to one such as yourself. But, that aside, this film reminded me very much of another, much better film we watched at Christmas. That time you cried like a young girl. Mathew: Okay, I did not cry like a girl. I may have shed a tear in a manly-weeping kind of way, but that's totally warranted given that the film you are referring to is It's A Wonderful Life. But you're right about the similarity. I am not giving anything away that was not already revealed in the trailer when I confirm that Shrek Forever After is a reworking of that fine film. Helm: A re-working? A plundering seems more accurate, only without being anywhere near as satisfying or charming as the original. Helm: In fact, I am at a loss to imagine why the makers of Shrek Forever After felt that it would be a good idea to remake It's A Wonderful Life as an animated story for children. It seems... age inappropriate. Mathew: Yeah, kinda. But I still enjoyed it. I mean, it was fun to see the characters again, the visuals and the animation were amazing, the vocal performances were solid, there was plenty of action and humor. Helm: I did not find it amusing. Ogres are dangerous creatures. Children should not be led to believe that such beasts have any redeeming qualities. I fear that a child, influenced by this film, might approach an ogre in the wild and be torn to pieces, that those pieces might then be torn to pieces and the resulting child-paste might then be eaten by the ogre without the slightest remorse. Mathew: Wow. That's an image. So you didn't like anything about this film at all? Helm: I found the chubby cat amusing. His laziness, ineptitude and self-importance reminded me of the more laughable aspects of you. Helm: There is nothing funny about ogres. Mathew: I don't think you totally get fiction, Helm.